.Not satisfied with run-of-the-mill coat and hall tree hooks you find at local hardware stores and home centers? Are you looking for more authentic reproduction antique hooks, from brass to rustic cast iron coat hooks? If so, you're in the right place. At Kennedy Hardware, we offer distinctive vintage-style coat and hall tree hooks to add that perfect (and perfectly functional) period look to your home. Whether it's the material, the finish, the number of hooks, or a specific style you are looking for, we've probably got it. At Kennedy Hardware, we offer coat hooks in single and double hook configurations. We offer them in solid brass and cast iron that looks old but works like new! And we offer them in many unique classic styles designed to match the antique look and vintage décor of your home. So, whether you plan to install an old-look reproduction coat hook one at a time, or build or restore a weathered, antique-look coat hook array, you can't go wrong with the authentic vintage-style hooks from Kennedy. Take a look at our online assortment. 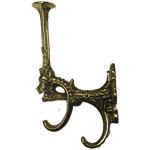 We think you'll find the perfect antique reproduction coat hooks for your home.